Everyone has a past. Everyone has a secret. Everyone is a suspect. 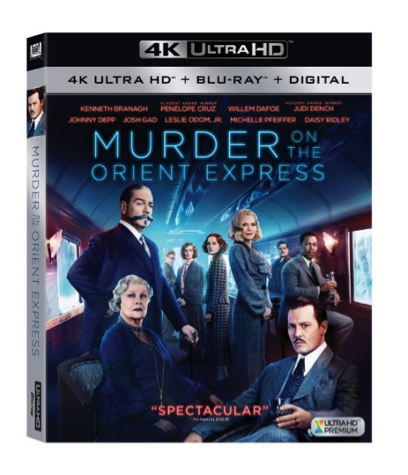 Twentieth Century Fox Home Entertainment presents the ultimate case of whodunit when MURDER ON THE ORIENT EXPRESSarrives on Digital February 20 and on 4K Ultra HD™, Blu-ray™ and DVD February 27. Kenneth Branagh directs and leads an all-star cast, including Johnny Depp, Michelle Pfeiffer, Penélope Cruz, Judi Dench and Leslie Odom, Jr., in this stylish, suspenseful and thrilling mystery based on the best selling novel by Agatha Christie. Everyone’s a suspect when a murder is committed on a lavish train ride, and a brilliant detective must race against time to solve the puzzle before the killer strikes again. MURDER ON THE ORIENT EXPRESS is a timeless classic that “will keep audiences guessing” (Peter Debruge, Variety). Produced by Branagh along with Ridley Scott (Alien: Covenant), Simon Kinberg (Logan), Mark Gordon (Molly’s Game), Judy Hofflund (As You Like It) and Michael Schaefer (The Martian), MURDER ON THE ORIENT EXPRESS is loaded with bonus material that dives into the making of the film including an eight-part documentary, eleven deleted scenes, commentary by Branagh and much more.